Welcome back, folks. I’m still in the process of recovering from the drudgery of finals, so please forgive me if you notice any coffee stains on the page. Don’t be surprised if I string off a bland chemistry formula at an inappropriate time either. But hey, let’s get started! One of the many complaints I hear about combos is that they are often very cost-intensive - understandable, considering that the best ‘Johnny’ cards are usually printed in the rare slot. Since many of us have limited budgets, we might not be able to experience the archtype, even in casual play. But there is no reason at all why combo cannot be built on a budget - in fact, there’s no reason at all why we even have to use rares! I’ll be using this column to go over an extremely affordable combo, with an equally-inexpensive, entirely rare-less deck to go with it as well. Sigh. Pass the coffee, please. 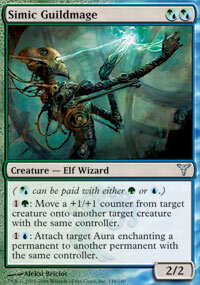 Simic Guildmage is a workhorse. It’s great for combat tricks in decks that utilize +1/+1 counters, but we’re not concerned with that aspect. What we care about is the second ability - the ability to move auras, or, more specifically, Fractured Loyalty. By combining these two, you essentially have an unlimited creature-stealing machine! Synopsis: This budget deck utilizes Simic Guildmage and Fractured Loyalty. 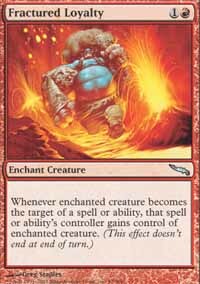 The idea is to get the Guildmage into play along with either Neurok Transmuter or Whip Sergeant, and then play Fractured Loyalty on an opponent’s creature. That done, you can target that creature and gain control of it, while at the same time using Simic Guildmage to move Loyalty onto another one of your opponent’s creatures. That way, you gain permanent control of the creature you just stole, and your opponent will not be able to get it back. You can do this until you have gained control of all your opponent’s creatures. Neurok Transmuter and Whip Sergeant can be used to cheaply target a Fractured’ creature. Compulsive Research and Concentrate make for good card advantage, and Muddle the Mixture can be used to transmute for either Simic Guildmage or Fractured Loyalty. Cancel and Shock are mainly for support, and Darksteel Ingot shouldn’t require an explanation. 1. Target the enchanted creature. Fractured Loyalty triggers. 2. Use Simic Guildmage’s second ability to move Fractured Loyalty onto another creature your opponent controls. This must be done before the Fractured Loyalty trigger resolves! So, obviously, if you are unable to spend any more mana to move Fractured Loyalty, you should not trigger it. Note that the cost of this decklist is less than the price of a single (Haakon, Scrouge of Stromgald) that I used last article. It’s less than a Six-Dollar Burger at Carl’s Junior. Hell, it’s four times as cheap as a Precon! You have absolutely no excuse for not giving this build a try. So with that, until next time, good luck, and have fun! fractured loyalty shouldnt even be triggered ever by the guildmage.. the guildmage text says specifically the aura. the only other target for it is the other permanent. That is a beautiful deck. I may well give it a go, and I have a suggestion to make it even more annoying, which also addresses the creatureless issue: Add in a little green and run a few Living Terrain. If your opponent isn't running creatures, then his lands can get up and walk over instead. Other than the 3x Shock and some counters, what else do you have against decks that aren't based on creatures? Specifically, you need a secondary kill condition. Trying to keep with the budget, adding Blaze ($0.25 each) with Extraplanar Lens ($0.60 each) to double your Island power provides more bang for the buck than six damage in pings. Secondary win condition (for creatureless decks) can be Thopter Foundry+Sword of the Meek, because you already have Muddle the Mixture for them. P.S. you can use the first Ability of Guildmage to target creatures, so your combo doesn't need the third piece, only +4*Terramorphic Expanse and +1 Forest.